In 1902 Ole Dahl (at age 7) and his family embarked on their long journey from Norway to America in hopes of living the “American Dream.” Speaking very little if any English, and only bringing what they could carry and what they were wearing, they landed in Newfoundland. For a year or so they made their way thru Canada, eventually arriving in North Dakota where they stayed with relatives for another year. They eventually settled into the a little community called “Central Valley” (which is just east of Silverdale) in 1905. Ole’s mother Anna formed a group of women called the “Ladies Aid” which eventually formed the Central Valley Church. It was dedicated in 1910 and eventually became the Silverdale Lutheran Church. All the services were spoken in Norwegian until the end of WWII. Ole being the craftsman that he was actually built his own fiddle and joined a small group of other musicians. They played for the weekend dances at the Central Valley Community Center, and it was there that he met his eventual wife Thea. They were married in 1916 and had two sons, Olaf and Harold. Ole was a contractor by trade and built the Bainbridge Island High school, the Port Townsend High School, and several large homes in Seabeck. Due to the rough terrain and lack of good roads, he often spent weeks at a time at the jobsite to alleviate the transportation issues. He was very “crafty” and could build anything. In 1932 Ole opened the Dahl’s Cabinet Shop. This shop was located on the current site of the Silverdale Landing Building & Yacht Club Broiler Restaurant. Back in those days the majority of all the lumber came by barge, being near the water allowed for easier access to the materials. In 1937, Ole moved his family to Silverdale to be closer to work. This house is the only original home left on Silverdale Way and is located across the street from the Jenne Wright Building (which was formerly Silverdale Elementary School). In 1946 Ole, Olaf, and Roy Peterson started Dahl & Peterson Lumber Company. This was a full service millwork, glass, paint, and cabinet shop. This building was located on the current site of the Oxford Suites Building, and they paid $7,000.00 for the property. People told Ole; “you’re moving so far out of town that people will never find you way out there!” Ole had several contractors that had “material books” under the counter. They would simply come by the lumber yard, load up what they needed for their day’s work, and then write it down in the book. At the end of the month, Ole would tally up what the contractors wrote down, and sent out their invoice. Now that’s called trust! Ole passed away in 1971, and from 1971-1972 Olaf and Harold kept the business as “Status Quo” handling the everyday duties, and keeping the “name alive.” These silly two brothers (who are 13 years apart) actually at one time held the Guinness Book of World Records for passing the same birthday card back and forth for 57 years! You see Olaf’s birthday is January 4th, and Harold’s is January 12th. While in the Air Force and stationed in Glendale Arizona, Harold sent a birthday card to his brother. Olaf thought it would be funny to simply re-send the card back to his brother a mere 8 days later. Holding that card for almost a full year, Harold then re-sent that same card back to his brother and this continued until the record was actually broken. The card became so brittle, that a wood box was built to hold the card and keep it protected! It became quite a challenge to find each year’s message on the card. In 1972 Harold, with four sons of his own and his very energetic wife Mary Lou, figured he had plenty of help to keep the business alive solely, but decided to only keep the “glass portion” of the business. He thus re-named the company Dahl and Sons Glass. Olaf ventured off to work with the newly formed Silverdale Water Company along with his wife Elaine. In 1982 Harold purchased property on Anderson Hill Road and built a new warehouse building attaching it to the existing house. With 22% interest, and very little work, this made for some long years. But the community support that was provided to Dahl and Sons Glass then, is still what kept the company surviving in the more recent recession of 2009. In 1992, son Kevin Dahl purchased the business from Harold and Mary Lou to become the third generation owner. Kevin eventually moved the shop from Silverdale to its current location in the Twelve Trees Business Park just north of Poulsbo. The company grew and added additional services and scope of work; a majority of the larger commercial buildings on the peninsula, and even in the greater Seattle area, exemplify the quality craftsmanship of Dahl Glass. Kevin recently made the decision to retire from the glass business and eventually selected Gabriel Rees to continue this long-standing family business. In 2015, Gabriel moved his family to Poulsbo and commenced the day-to-day management of Dahl Glass. 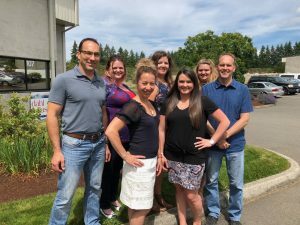 We continue to provide the same quality customer service that we have provided to the greater Puget Sound area since 1946. We want to sincerely thank our local community for its endless years of support, and we look forward to many more years of servicing your glass and window needs.